Dhani got glad and asked him to teach her. Viplav said he didn’t want her to stop her studies. He said nobody would think women weak then onwards. Dhaani hugged him happily. Viplav said her dreams would come true and asked her not to hurry up and study well. He said everyone would be proud of her. Dasharath thought where those bags went. He kicked the servant who was massaging his feet and said his nails had pierced into his skin. Dhaani came and helped a servant to get up. Dasharath asked her to leave him alone for some time. Dhaani thought to do something and went. Kanak came and asked Dasharath if his mood was not good. Dasharath asked how did she know, and that meant she had stolen the things. Dasharath said two bags were missing and asked where she kept them. Dasharath told Dadi bua that he was angry and worried about the day before’s incident. Phool Chand came and called Dasharath. Dadi bua asked Kanak to come. Dhaani came to the police station and said she was silent because she thought of her family’s respect, but her family was hurt. She said she thought Asthana should be punished for his doings, and he was using his powers wrongly. Inspector stated that they needed a witness. Dhaani said her family would support her and become a witness. Dasharath asked Phool Chand what the matter was. He told Ddi bua that he would build Sita temple and trust and was taking everything from Dasharath’s hands. Dasharath said that was his plan. 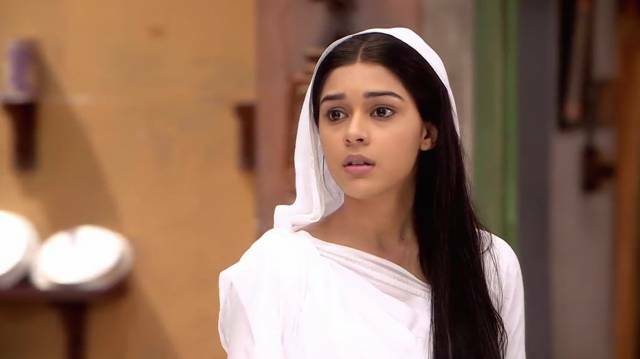 Viplav said that was Dadi Ji’s decision to build the temple. He said how he could say that he won’t work any longer. Viplav stated that they were greedy and wanted gold. Phool Chand talked ill about Dhani’s character. Viplav got angry and grabbed his collar. He said he didn’t care who was Pandit and who was judge, he would bury him right there. Dadi bua asked Viplav to leave him. She said if prostitutes studied in school then why their family name was ruined. Dasharath asked them to pick the suitcase and left. Ram Deen said there were no bags. Dasharath said he had that much stuff only. Phool Chand threatened to call the police. He informed Asthana. Asthana got happy and said he would get him rotten in jail. Kamini came there. Asthana pointed a gun at her. What he said was Kamini, she had played such a game with Tripathi family, that they would fall on his feet all their life. Kamini asked him to stop the crap and concentrate on Dhaani. Dhaani came home and said she had filed a police complaint against Asthana. Dasharath was shocked. Other inspector came and asked what was missing in that. Phool Chand smirked. Inspector said arrested him. Sushma said he had kept things in the almari and could never steal. Viplav asked Sushma not to worry and promised to bring Dasharath back home. Dhaani asked Sushma not to cry. Kanak scolded Dhaani. Dadi bua scolded Dhaani and for wearing a backless blouse in the party. She said Viplav had insulted Asthana for her, and now he was taking revenge. Kanak said Asthana would not leave them, and asked Dhaani why she did that. Dhaani said Asthana should be punished. She said Dada Ji would get justice. Sushma asked them to stop that, and her condition worsened. Kanak asked Dhaani to call the doctor. Dhaani couldn’t read anything and worried. Stay tuned for latest Ishq Kaa Rangg Safed news and updates.